Direct burial package includes: professional services of funeral director, staff & overhead, local transfer of deceased from place of death to our care, topical hygienic care, dressing, casketing & cosmetising and funeral van to local cemetery. Graveside service package includes: professional services of funeral director, staff & overhead, local transfer of deceased from place of death to our care, topical hygienic care, dressing, casketing & cosmetising, funeral van to local cemetery and supervision of committal graveside service. One day traditional service package includes: professional services of funeral director, staff & overhead, local transfer of deceased from place of death to our care, embalming & topical hygienic care, dressing, casketing & cosmetising, visitation prior to funeral service on the same day, funeral van to local cemetery and suspervision of committal graveside service. Two day traditional service package includes: professional services of funeral director, staff & overhead, local transfer of deceased from place of death to our care, embalming & topical hygienic care, dressing, casketing & cosmetising, visitation and funeral service over two days, funeral van to local cemetery and supervision of committal graveside service. Direct cremation package includes: professional services of funeral director, staff & overhead, local transfer of deceased from place of death to our care, identification by picture or at place of death, refrigeration and cremation. Cremation with graveside service package includes: professional services of funeral director, staff & overhead, local transfer of deceased from place of death to our care, identification by picture or at place of death, refrigeration, cremation, funeral van to local cemetery and supervision of committal graveside service. 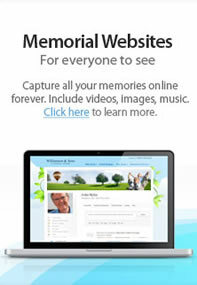 Cremation with memorial service package includes: professional services of funeral director, staff & overhead, local transfer of deceased from place of death to our care, identification by picture or at place of death, refrigeration, cremation and visitation prior to memorial service on the same day. Cremation with one day traditional service package includes: professional services of funeral director, staff & overhead, local transfer of deceased from place of death to our care, embalming & topical hygienic care, dressing, casketing & cosmetising, visitation prior to funeral service on the same day and cremation.